Family, friends and noted rabbis join to lay soldier Ziv Mizrahi to rest, recounting his heroism saving comrades after being stabbed. Hundreds of people showed up on Tuesday for the funeral of IDF Corporal Ziv Mizrahi of Givat Ze'ev, who was murdered in a stabbing attack the day before at a gas station on Highway 443 northwest of Jerusalem. Mizrahi's father, Doron Mizrahi, whose brother was murdered 13 years ago in a terror attack in Jerusalem, eulogized his son. "They will not destroy our spirit, we will cry and we will mourn. Next Wednesday I will return to work," said the bereaved father. "May the names of the haters of Israel be erased, the nation of Israel lives, it won't help them, they won't destroy our spirit. Thirteen years ago I lost my brother and thought that I had paid the price with that. Ziv saved his officer, he shot the terrorists with a knife in his heart - that's Ziv, a hero of Israel." In the attack, a 16-year-old terrorist - who is the cousin of a terrorist who carried out a knife attack at the same gas station last August - sneaked up on Mizrahi and stabbed him, and alsowounded a 22-year-old woman. A 50-year-old woman was wounded from a stray bullet from security forces who stopped the attack. Video from the funeral can be seen below. Jerusalem Chief Rabbi Shlomo Amar also took part in the funeral, saying, "again we stand before holy ones. Everything that was in him was for the land of Israel, may God avenge his blood." "Many ask how long will we suffer. He have no answer but it is written - everything is from G-d, everything," continued the rabbi. "We don't know the reasons but we rely on the Holy One blessed be He. Let us take advantage of this great gathering, Ziv is now rising before our Father in heaven to a world that is wholly good. But the sorrow is great for us that we must separate from a man at such a young age." "This world is one great dream. People think that this is the real world. The world above is the real world. The angels are now receiving you up above. The Holy One blessed be He is rejoicing to receiving a soul like this. We ask you, be an envoy of all those who were taken and ask how long will they pursue after us, and as for you go and rest until the end of days." Rabbi Yosef Toledano, the rabbi of Givat Ze'ev, said, "we bring a hero to rest. Ziv was killed for being a Jew who defends the land of Israel, defends IDF soldiers. Ziv was holy and was taken like Rabbi Akiva who was holy and was killed to sanctify G-d's name because he was a Jew. We call on the government to increase the security on us. Those who encourage murder must go to jail. This is a true war." Also eulogizing the young soldier was Hannah, Ziv's former teacher. She said, "we had arranged to meet in another five years. They say that G-d takes only the good ones, that's what they always say. But you truly were. Now I'm a bereaved mother too. I promise that we will always remember you." "I don't know where to start," said Lidor Mizrahi, the victim's brother. "How can I eulogize you at such a young age? How proud I was that you were named after grandpa Zakai. I want to give a message to all haters of Israel - you will not break the people of Israel, you will not be able to break us. Ziv, I admire you. I cannot change fate. This is what God wanted. God gave and G-d took." 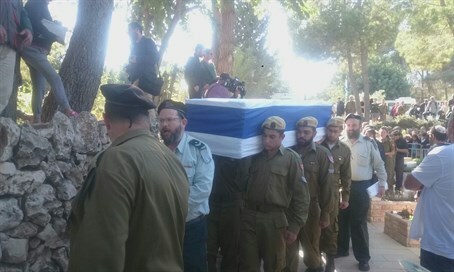 A neighbor of the family, Galia Amar, told Arutz Sheva at the funeral that "we all don't want to be here (burying him), Ziv grew up with my kids since nursery school." "Givon is a rural town that is very family based, it's basically one big neighborhood," she said of the area where he grew up. "We sat together every night with lots of friends. Ziv was a good friend of my son Yair, they have lots of friends, Ziv was simply an angel." "When it became known to us and the rumor began to circulate, all of the friends hoped that it wasn't real," recalled Amar of the previous night's tensions. "After we got the message Yair contacted all the friends, they sat here at our home until the morning. Dozens of friends who were connected by heart and soul." "It sounds like a cliche, but Ziv was truly an angel with a wonderful smile, he was shy, sensitive and caring. There are no words, we lost a great angel."